For all you paranoiacs out there that know that you either are or soon will be under 24-hour surveillance by little flying robot drones, well, your worst fears are about to be realized. And you have the locust to blame for it. For years engineers have struggled with the 'bumblebee paradox': the claim that insects fly in defiance of known aerodynamic laws. 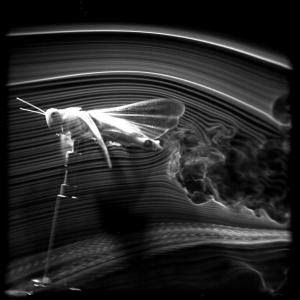 Thanks to new research involving insect flight in wind tunnels and high speed photography, we now know how they do it. And life will never be the same. Unlike your typical streamlined aircraft wing or blade, insects have very complicated wing structures that twist and bend and change in flight, with wrinkles and folds, etc. Using computer models, we are now, for the first time, able to recreate insect flight. What's so important about that? Well, locusts (as pictured here) are able to fly very long distances with minimal energy reserves, and we want our mini robot drones to be able to do that too. It'll be incredibly useful in search and rescue, warfare, and in watching through your upstairs window. So, the next time you hear a buzzing noise somewhere in the room, or just outside, don't dismiss it as a bug flying by. It could quite possibly be that the government, or the shadow government, is keeping tabs on you and your fellow in-the-know freedom fighters with its new legion of flapping robots.